Dimensions 0.75 by 5 by 8 in. A memoir begun just months before Child's death describes the legendary food expert's years in Paris, Marseille, and Provence and her journey from a young woman from Pasadena who cannot cook or speak any French to the publication of her legendary Mastering cookbooks and her winning the hearts of America as 'The French Chef.' Reprint. 175,000 first printing. Amazon.com description: Product Description: The bestselling story of Juliaâs years in Franceâand the basis for Julie & Julia, starring Meryl Streep and Amy Adamsâin her own words. Although she would later singlehandedly create a new approach to American cuisine with her cookbookÂ Mastering the Art of French CookingÂ and her television showÂ The French Chef, Julia Child was not always a master chef. Indeed, when she first arrived in France in 1948 with her husband, Paul, who was to work for the USIS, she spoke no French and knew nothing about the country itself. But as she dove into French culture, buying food at local markets and taking classes at the Cordon Bleu, her life changed forever with her newfound passion for cooking and teaching. 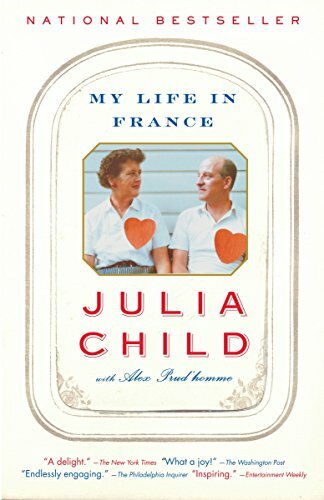 Juliaâs unforgettable storyâstruggles with the head of the Cordon Bleu, rejections from publishers to whom she sent her now-famous cookbook, a wonderful, nearly fifty-year long marriage that took the Childs across the globeâunfolds with the spirit so key to Juliaâs success as a chef and a writer, brilliantly capturing one of Americaâs most endearing personalities. About: Here is the captivating story of Julia Child's years in France, where she fell in love with French food and found 'her true calling. About: A memoir begun just months before Child's death describes the legendary food expert's years in Paris, Marseille, and Provence and her journey from a young woman from Pasadena who cannot cook or speak any French to the publication of her legendary Mastering cookbooks and her winning the hearts of America as 'The French Chef. About: The legendary food expert describes her years in Paris, Marseille, and Provence and her journey from a young woman who could not cook or speak any French to the publication of her cookbooks and becoming 'The French Chef.